I love asters (Aster spp.) for the cheerful notes they add to my garden in summer. Generally they’re low maintenance plants and it’s easy to grow asters from seed. They resemble daisies with their star-shaped heads and they attract butterflies. 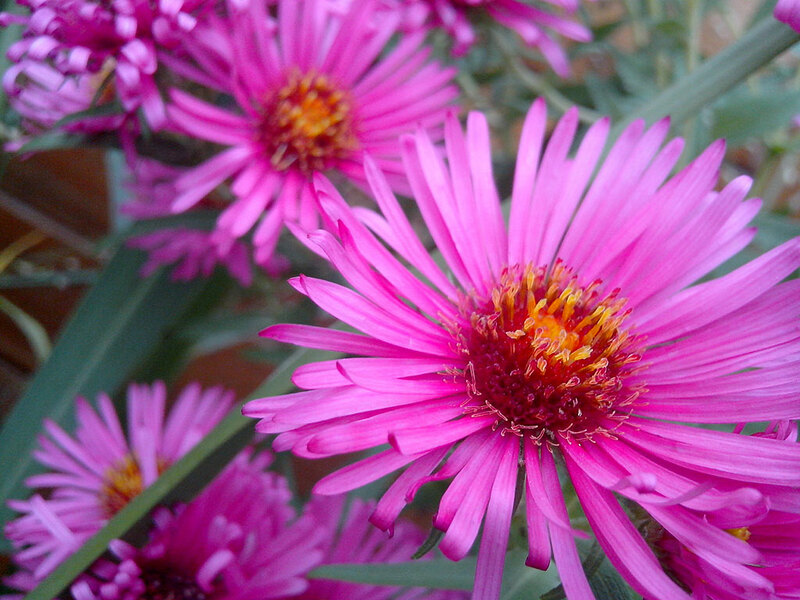 Aster is a genus of plants in the Asteraceae family. There are about 180 species of asters in total. Asters bloom in summer and fall. For a great article about how to care for cut flowers and foliage, check out the article by the University of Illinois Extension Service. Some varieties are compact, while others can grow as tall as 8 feet and will require staking. If you want to keep the plants on the compact side, prune or pinch them back in midsummer. Getting the right moisture level is the key with them; too little or too much water and they may not flower properly. So just keep an eye on them to spot any issues early on, especially when they’re young. When you grow asters outside or in containers, be sure to give them 1-2 inches of mulch to prevent the soil from drying out too much. Also, try to water them at ground level. They’re susceptible to powdery mildew and fungal diseases, and keeping the leaves dry is a good preventative measure. The mildew won’t kill the flowers, but it won’t look pretty. The main culprit you may battle is gray lace bugs, which like to feed on the succulent stems. Asters fit in well in borders, wildflower gardens, rock gardens, dry zones, and around water features like ponds. You can also buy aster seed balls on Amazon for seed bombing large areas. And Walmart sells packs of 1,000 aster seeds. For more seed catalogs see my article on the best seed catalogs. Which are your favorite varieties of asters? Leave a comment below!